Ubisoft has added the latest live event for Far Cry 5, ‘White Collar Job’, and for once the prize isn’t just a costume or a weapon decal, it’s a brand new gun. And not just any gun: a shovel launcher. Which is exactly what it sounds like. Need an extra hand in Far Cry 5? Here’s how to unlock every gun for hire! Yes, even the bear. The event tasks players with killing as many wolves with arrows as they can, which includes Jacob’s mutated Judges. If you can get 10 kills then you’re rewarded with a shovel launcher. It acts like an RPG except it fires up to three shovels instead – and is probably closest to a harpoon gun. If the community as a whole can get more than 500,000 kills then all players who took part will get male and female Jacob’s Hunter outfits. It’s the shovel gun that’s more interesting, since it’s based on the much loved melee weapon. 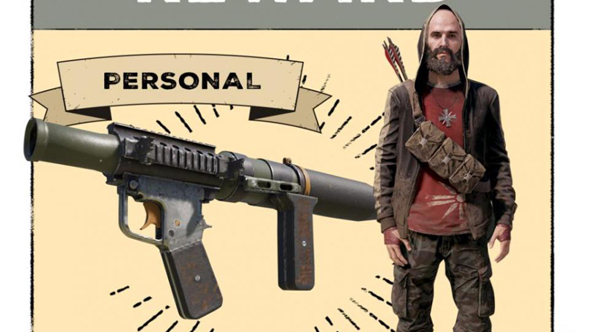 When Far Cry 5 released players quickly discovered that not only could shovels be thrown, and were ridiculously overpowered, but also after buying the right Perks it was possible to equip up to nine of the things. Players coined the term “shovels thrown per minute” or ‘STPM’, which became the subject of memes. It’s great to see Ubisoft indulging the community’s shovel love. And with Far Cry 5 riding high in the charts, why not?